During the spring Mystery Class season, the weekly photoperiod data your students receive will slowly reveal information about the latitude of the 10 Mystery site locations. Examine the data to find patterns and surprises. Make predictions and compare findings. 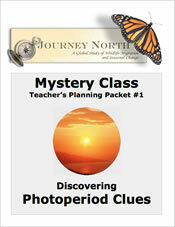 Reflect in your Mystery Class journal. We hope the practice packet will give you a chance to experience the process of discovery your students will have when they begin to collect, organize, and analyze data to identify the locations of this year’s mystery classes. What can seasonal changes in sunlight reveal about a location's latitude?